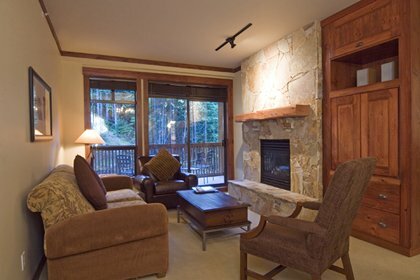 First Tracks Lodge in Creekside is literally steps from the Creekside and Kadenwood Gondolas. It doesn’t get more ski in and out than this. This luxury hotel offers spacious suites with stone,slate and glass accented with heavy timbers. The gourmet kitchens feature stainless steel appliances and granite counter tops. The village can be accessed by the bus (for a fee), that has regular service all-day and late into the night. Legends is ideal for couples and families who are looking for upscale, luxury accommodation with ski in, ski out access but without the price of the main Village. On the doorstep of the lodge is ski school, rental shop, many restaurants, Dusty’s Bar, and the excellent Creekside grocery store. First Tracks Lodge is definitely Creeksides and possibly Whistlers’ closest hotel to the ski lifts. Literally walk out the door of the ski storage room and you can practically reach over and touch the gondola. The combination of location, luxury amenities and extremely spacious suites makes this boutique luxury hotel one of our favourite Whistler accommodations. The Red Door – Our favourite restaurant, great food in a great atmosphere fine dining with reasonable price tag. We highly recommend using Skiing BC for your trip to Whistler. The staff was knowledgeable and really understood what our family was looking for in a vacation. Everything from planning the vacation, arrival through to communications while we were there went well and we felt well taken care of. A beautiful place to visit. There recommendation of First Tracks Lodge was brilliant. Bedding in the unit consists of 1 king bed, 1 queen bed and 1 queen sofa bed. Bedding in the unit consists of 1 king bed, 2 queen beds and 1 queen sofa bed.